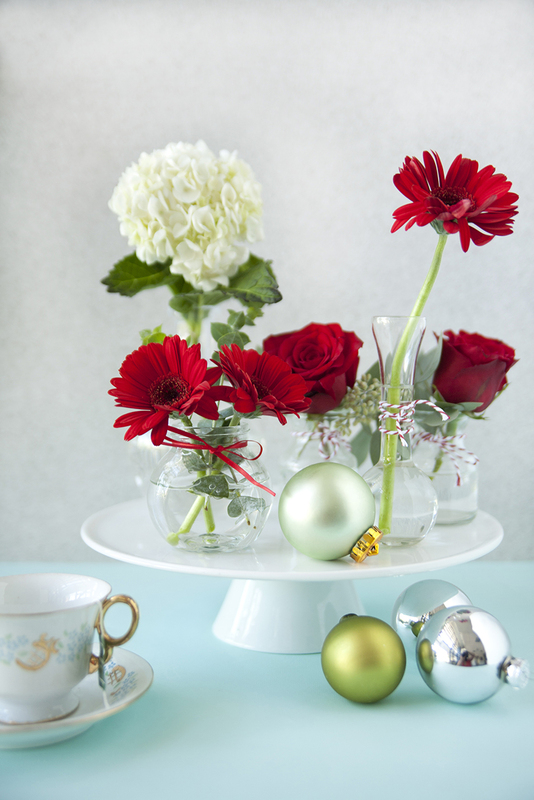 Try these sweet, simple and clever flower arrangement ideas for your holiday table. Whether your planning a holiday party or hosting Christmas dinner this year, your table setting is the pretty packaging around your delicious dinner. Play with festive linens and place settings for the occasion, and top it off with a centerpiece that brings the whole look together. 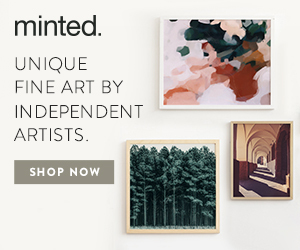 Is there a formula for creating your centerpiece perfectly? Well, sort of. 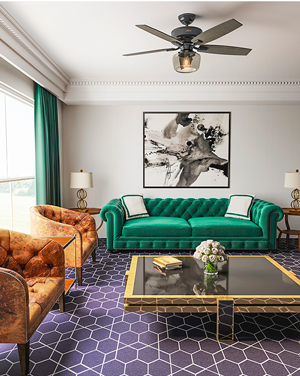 Before you begin designing, consider the shape of your table. Round tables look great with one showstopper in the center. Square tables are more flexible: they can look great with one, but also have room for two depending on the number of guests your seating at the table. Rectangular tables look best with three centerpieces, one in the middle and one on each end so that all your guests have a centerpiece nearby to admire. Tip: Centerpieces help start conversations—so make sure your centerpieces aren’t too tall so that your guests can see over them. You don’t need a ton of flowers to make an impact either. These clever and creative ideas use old items in new ways to give your centerpiece some wow factor. 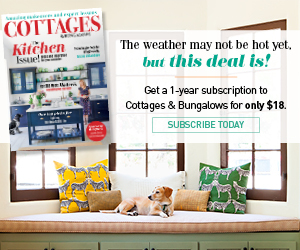 It’s budget-friendly, and frankly, more fun! Take a look at our ideas below and let us spark your imagination. So Gifted. 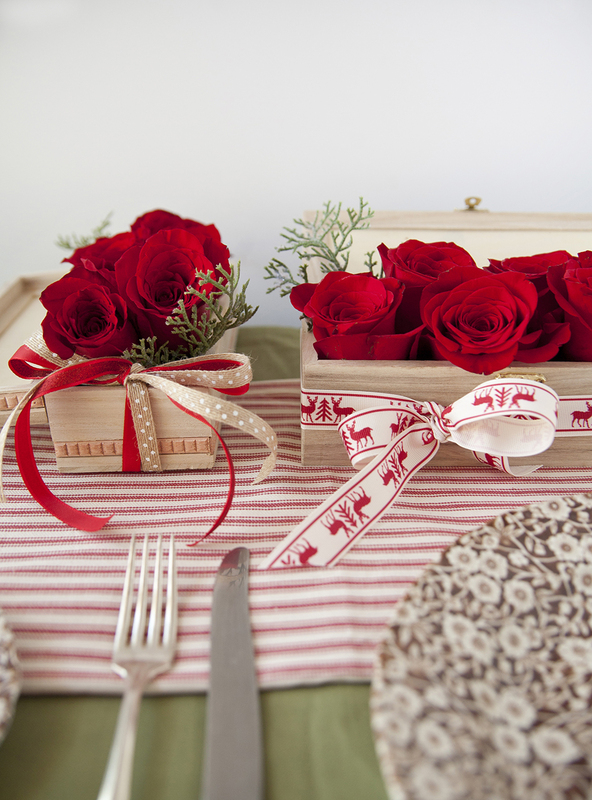 Treat your centerpieces like presents by using a lidded box as your container. 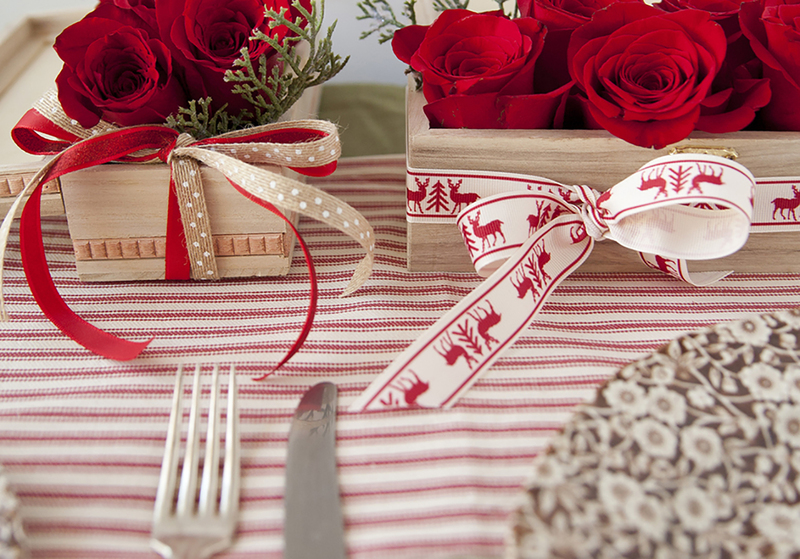 Add ribbon to emphasize the gift theme, and guests can take these treats home—wrapping and all. Play It Again. Upcycle your mix-and-match set of glassware into an artful display of flowers. 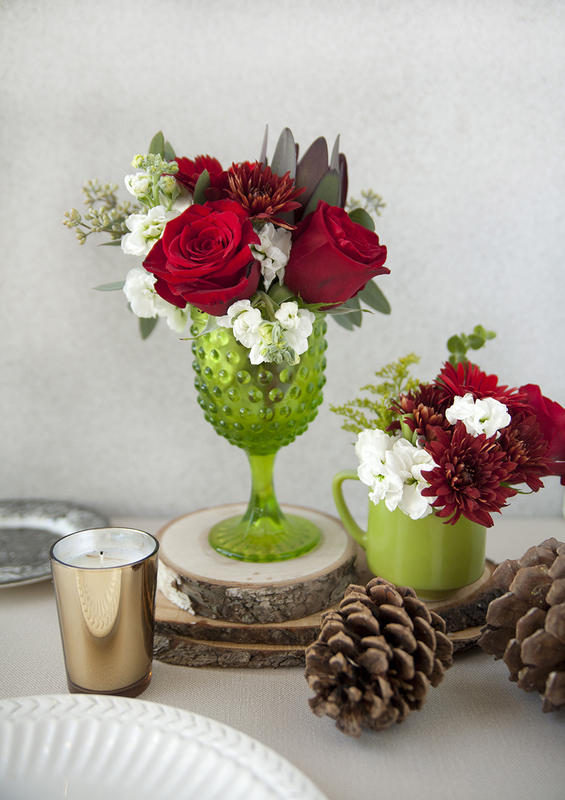 Pick one color—here green is the perfect festive compliment to red roses—and spread your glasses down the center of the table for maximum impact. Bonus: Use pieces of wood or books to elevate some glasses and create a more dynamic display. A Bright Idea. 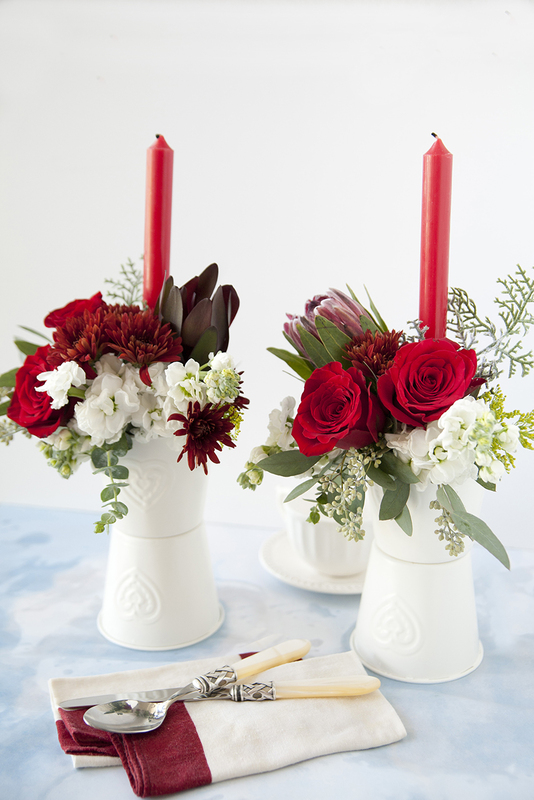 Stack a pair of pots (invert one as a base; then place the second atop it) to make a unique candlestick-vase combo. Use floral foam to hold your candle and blooms in place. For extra security, use museum wax or foam tape to keep the stacked pots steady on the dinner table. The Power of Many: Cluster a mix of small bud vases on a pedestal to elevate a motley crew of glassware into an elegant artistic display. To unify them a bit and add some festive flair, tie red-and-white baker’s twine around each one.